When she begins therapy for depression after breast cancer treatment, the author brings with her an extraordinarily open and critical mind, but also shyness about revealing herself. Resisting easy responses to issues of dependence, desire, and mortality, she warily commits to a male therapist who shares little of her cultural and intellectual world. 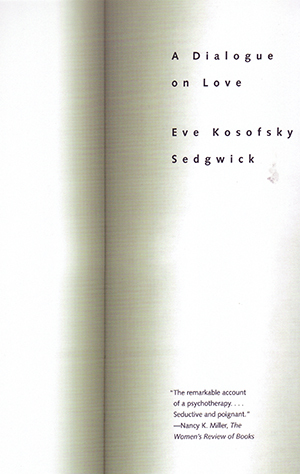 Although not without pain, their improvised relationship is as unexpectedly pleasurable as her writing is unconventional: Sedgwick combines dialogue, verse, and even her therapist’s notes to explore her interior life--and delivers and delicate and tender account of how we arrive at love.